The Volvo oil trap is often overlooked and most people have never heard of it, but if it's not replaced every 100,000 miles it can wreak havoc on your checkbook. You may be asking yourself what is an oil trap? Where is it located? Why do i need to replace it? What is it? Those of us over a certain age remember older cars having a PCV valve (Positive Crankcase Ventilation). 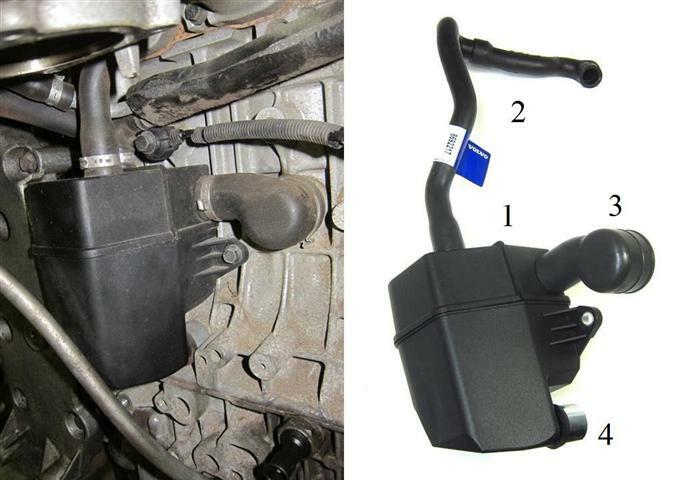 The Volvo oil trap accomplishes the same thing as a PCV valve which is allow the engine to breath. You may not know this but the combustion engine needs air coming in and therefore air going out. When the air cannot escape it builds up pressure in the engine and (pay attention this is where it can cost you a lot of money) it seeks other places to release air which means losing air and oil via the exhaust pipe which is not a good thing or it will find the weakest and often the hardest to get to oil seal and cause a leak. Leaking oil seals, especially the ones in very hard to get to places such as the rear main seal which requires you pull the transmission lose from the engine can cost you thousands of dollars in repairs. Oil leaks which can be seen below the engine or on top of the valve cover is common too. Look at the oil fill cap on top of the engine and look for oil residue. Also look at your engine oil dipstick for leaks. Engine Oil dipstick pops out of the pipe and keeps doing it every time you run the engine. This is a very common sign as the air pushes up the oil dipstick which is held in place by two o-rings. If the engine builds up enough internal pressure it will push up the oil dipstick to release air. Bad gas mileage. All of this air building up in the engine fights against the normal operation of the crankshaft rotating, pistons pumping up and valves opening which can seriously cost you a lot of money at the gas pump. Engine idles rough and runs bad. Unfortunately by the time you reach this stage the oil trap issues have probably cause severe damage to internal engine parts and oil seals. I'm not saying it can't be improved by changing the oil trap, flushing the oil system and adding fully synthetic oil but trust me miles have been taken off your engines life. Where is it located? This is fairly easy to explain because on just about every Volvo model the oil trap is located to the side of the engine block underneath the intake manifold. A few exceptions are when the oil trap is actually built into the oil filter box on Volvo C30, C70 2006-Up, S40 2004.5-Up and V50 models. Your probably want to know how to replace it and what parts are required? In varies slightly but most often you need an oil trap, intake gasket, oil trap to valve cover hose, oil trap to block seal and any hose that upon inspection looks cracked, brittle or has holes already caused by hot burning oil and air trying to escape. In most cases you will need to remove the intake manifold just to reach the oil trap and then the actual removal of the oil trap and parts are very easy and using only require a ratchet and socket to remove the 4-5 screws and a screwdriver for the hose clamps. Why do I need to replace it every 100K? Not only does Volvo recommend you replace it every 100,000 miles but that is often when we see customers calling us asking for help and describing the syptoms I outlined above. This is one part you do not fudge and push it off for another 5-10K miles or you may live to regret it. OK the reason why it has to be replaced is because oil and oil residue (gunk is the official term) starts to build up in the oil trap and eventually in the oil trap hoses and creates a blockage which stops up the engine so it cannot breath. In the old, old days engines had a breather cap located on the valve cover and the air/oil mixture just came out the cap and you would wipe up the oil residue off your valve cover. The PCV system came out in the 60's which allowed the engine to exhale via a large vacuum hose and the PCV valve would open at the right time and let the air go back into the engine sort of recycling the air yet allowing the engine to breath. For the sake of the global environment Volvo created a better system that would collect all gunk into a box, preventing it from escaping into the atmosphere and you simply change the box out just like other filters during scheduled maintenance. The problem is (as I see it) consumers are not as informed about this as there are about oil and air filters and therefor costly repairs that could have been avoided catch them by surprise.